The second addition to the Mini 4WD REV Series is the Aero Thunder Shot. The newly-designed body was created with aerodynamics in mind and features beautiful curves as well as front and rear air intakes. This machine is the first model in the REV Series line-up that comes equipped with large-diameter wheels and arched tires as standard equipment. The AR chassis is designed to offer its driver durability, customizability and ease of maintenance, all of which are vital ingredients for a successful Mini 4WD racer. Its aerodynamic form smoothly allows air to pass through the chassis interior as the machine runs, performing the vital function of cooling the batteries and motor and extending their effectiveness. The air intakes on the chassis and body are integrated for optimal performance. 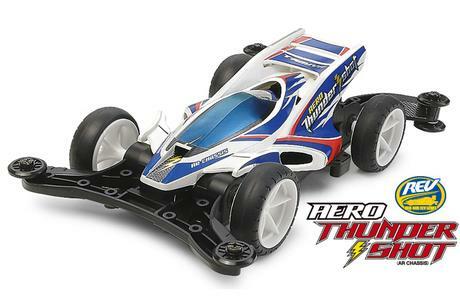 This high-speed racing chassis also features low-friction plastic bearings to ensure that any loss of power from the engine to the wheels is minimal in nature. The under-panel and diffuser can be removed from the model without taking off the body, while a low-friction rear skid bar is fitted to slash time loss experienced on tricky slope sections, and keep the racer on the track where it belongs. Features a 4.2:1 gear ratio.